Beat the rush for enrolment supplies and claim FREE card holders with all bespoke lanyards. Back by popular demand! Offer valid between 1st March and 30th April. Terms apply. 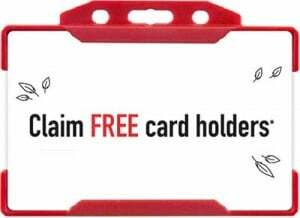 GET IN TOUCH TO CLAIM YOUR FREEBIES NOW! Claim 1 free single-sided open faced landscape card holder for every 1 bespoke lanyard order between 1st March and 30th April 2018. Minimum order of 1,000 lanyards. Offer available on purchases with multiple bespoke lanyard designs. While stocks last. Excludes trade sales.